Have you discovered the magic of Sparkle Stories yet??? We discovered them one month ago and I am not lying when I said they have changed our lives. Sparkle Stories are the genius creation of David Sewell McCann. David is a gifted storyteller from Vermont and he and his talented wife work together to each week bring families rich and wonderful stories to be listened to again and again. I had heard about Sparkle Stories for many months before I dove in and actually checked them out. I downloaded one of the free stories I found on the Sparkle Stories blog called Daddycation. I spread out some crayons and paper, a small snack and put on the story for my son (5) and daughter (2). I had planned to use this time to get some chores done around the house but instead ended up taking a much-needed break coloring and listening to this beautiful story. We were immediately hooked and signed up on the spot. Our favorite series at the moment is the Martin and Sylvia series but there are 6 different options and they are currently working on a 7th…a Super Hero series. Sparkle Stories will be apart of our family for years to come. Friday’s are an exciting day in this house because the new stories arrive. At the moment we are signed up for the 3 story a week plan but once we have built up a collection of stories, we will most likely go down to the one story a week plan. Did I mention the stories are yours forever??? You download them onto your computer and then they can be listened to again and again. 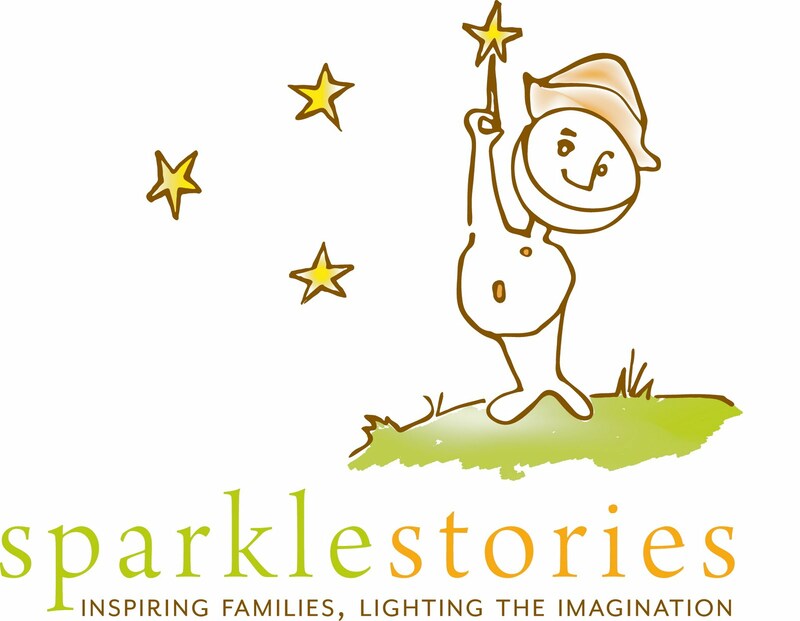 Sparkle Stories also offers gift certificates so that you can give the gift of story to the children in your life. The art of storytelling is such a magical thing. David’s stories allow children and adults a chance to relax, listen and create a world full of images in our minds. They also teach rich lessons and inspire and encourage all of us to go out and explore our world. In a world that is so rushed and busy, it is important to take time to slow down and breathe. Sparkle Stories allow us to do just that. We have cut our daily media time in half (now only 30 min) thanks to David’s gift of story and my son begs to hear a story every day. When the music starts up he smiles and starts to dance. I remember the first week he said, “Mommy, this music makes me feel like dancing!”. I smiled and joined him and we have been dancing ever since. You could enter a chance to win your own pot of gold…a year subscription to the Sparkle Story of your choice!!! Click here to find out more. There is also a “magic code” to allow you to try Sparkle Stories for a month for only $1. So head on over to their website and check it out!! !